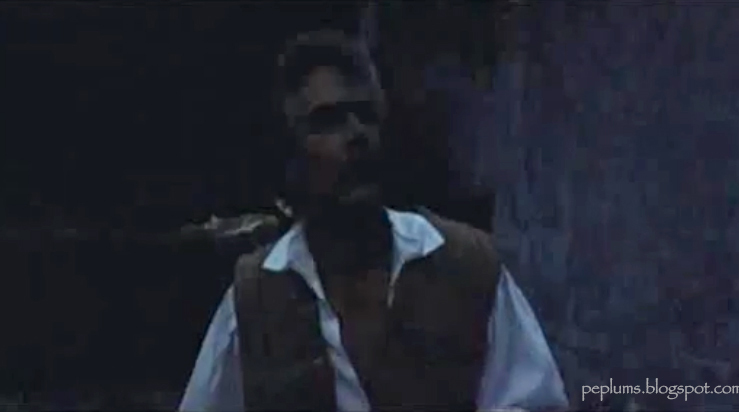 This dark image is Kerwin Mathews in NIGHTMARE IN BLOOD. It's actually not a PEPLUM film but this horror movie starts with a Swashbuckler film being projected in a movie theatre and it features Kerwin. It's a film within a film moment. After we see 'The End' as the Swashbuckler finishes and the real horror story begins we don't see Kerwin anymore. I wish the copy I have was at least bright enough to see Kerwin correctly but no. It's sort of a sad end to a great PEPLUM career. Do you have any idea which movie was being shown? It's not a real movie but a fake movie and they hired Kerwin Matthews to play Swashbuckling hero in this pretend sequence. It's a film within a film.